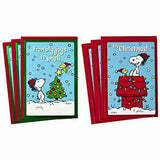 Send good tidings to friends or family this holiday season with this fun pack of Snoopy Christmas cards. 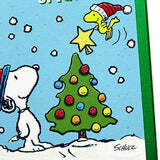 First design features Snoopy and Woodstock decorating a Christmas tree. Front reads: "From big joys to small . . .," and inside reads: ". 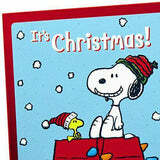 . . hope this Christmas tops them all!" 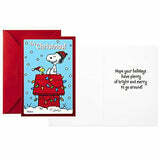 Second design features Snoopy and Woodstock sitting on top of Snoopy's decorated dog house. Front reads: "It's Christmas!" and inside reads: "Hope your holidays have plenty of bright and merry to go around!" 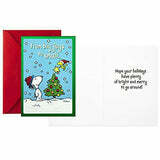 Buy in bulk to write a note of season's greetings to everyone on your holiday card list. Holiday card pack contains 6 greeting cards in two cheerful Peanuts designs (3 of each design) and 6 envelopes. Cards measure 4.4" x 6.4". 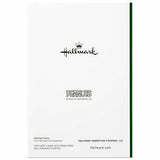 Printed on high quality paper stock, all Hallmark stationery is made with paper from well-managed forests.